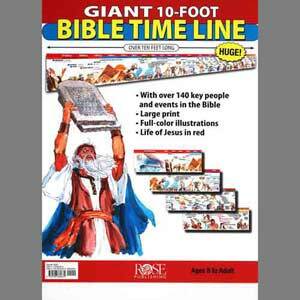 Put a sweeping history of the Bible on the wall of your classroom, home, or office. This bestselling Classroom 10-Foot Bible Time Line presents more than 140 key people and events and includes the ruling years of kings, prophets, dates of battles, and events from Adam and Eve to Jesus and the Apostle Paul. Colorful illustrations make it easy to identify the various periods in biblical history. Now you and your students can experience the events of Bible history at a glance! Classroom 10-Foot Bible Time Line helps students to see and remember Old and New Testament people in the order they appeared in history, and events in the order they occurred. Pastors and teachers will want one in every teaching area for children, teens, and adults. Size: Comes in an 8.5" x 11" envelope; Unfolds to 10' x 11". Easy to put together in four panels. Helping you teach the next generation to know God!